From Steven Johnson, the dynamic thinker routinely compared to James Gleick, Dava Sobel, and Malcolm Gladwell, The Ghost Map is a riveting page-turner about a real-life historical hero, Dr. John Snow. It's the summer of 1854, and London is just emerging as one of the first modern cities in the world. But lacking the infrastructure -- garbage removal, clean water, sewers -- necessary to support its rapidly expanding population, the city has become the perfect breeding ground for a terrifying disease no one knows how to cure. As the cholera outbreak takes hold, a physician and a local curate are spurred to action-and ultimately solve the most pressing medical riddle of their time. 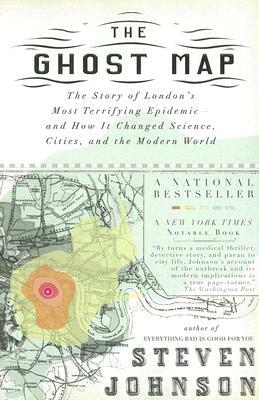 In a triumph of multidisciplinary thinking, Johnson illuminates the intertwined histories and interconnectedness of the spread of disease, contagion theory, the rise of cities, and the nature of scientific inquiry, offering both a riveting history and a powerful explanation of how it has shaped the world we live in. Steven Johnson is the bestselling author of eleven books, including Where Good Ideas Come From, Wonderland, and The Ghost Map. He's the host and co-creator of the Emmy-winning PBS/BBC series How We Got To Now, and the host of the podcast American Innovations. He lives in Brooklyn and Marin County, California with his wife and three sons.